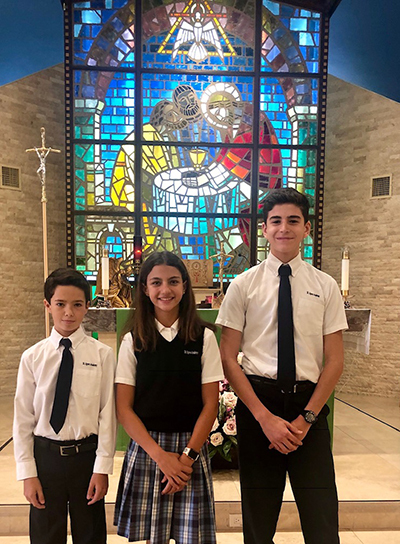 St. Agnes Academy's 2019 ISSF Star Students are, from left: Santiago Perez-Loperena, Andrea Montaner, and Nicolas Nadal. KEY BISCAYNE | Each year, the Independent Schools of South Florida recognizes outstanding students from its member schools. An ISSF Star Student sets an example for others to follow, whether in the home, school or community. ISSF students excel in one or more of the following areas: academics, community service, citizenship, fine arts, athletics, student activities, perseverance, effort, dedication, commitment to positive goals, improvement in performance and attitude. This year’s winners for St. Agnes Academy are Santiago Perez-Loperena, Andrea Montaner and Nicolas Nadal. They will be honored at a luncheon scheduled for Wednesday, April 3.